STERLING HEIGHTS — General Dynamics Land Systems, a business unit of General Dynamics (NYSE: GD) has a $7 million extension on its work on an Amphibious Combat Vehicle for the United States Marine Corps. 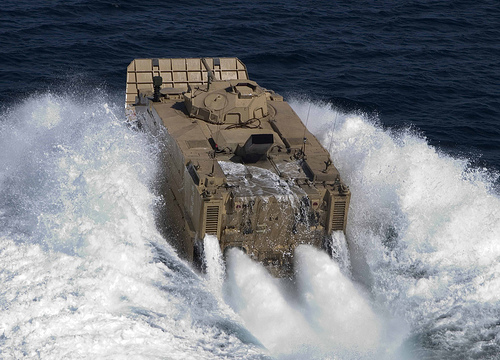 The five-month contract extension will see General Dynamics continue its ongoing work to determine the best option for developing an affordable, survivable and high water speed ACV platform for the Marine Corps. The effort includes flexibility and modularity analysis of the requirements, concept refinement and experimentation planning, which will help the Marine Corps understand the risks and determine the best approach for developing the ACV. The work will be completed by existing employees in Sterling Heights. Prior to this current ACV project, General Dynamics Land Systems funded its own internal testing in 2012 and 2013 to assess the performance of its hull design against the Marine Corps’ mine blast requirements for the amphibious vehicle. The highly successful test was completed at the National Ordnance and Ballistic Test Center in Camden, Ark., and provided an early assessment of the low-risk, mature and affordable ACV solution that General Dynamics can deliver to the Marine Corps. General Dynamics Information Technology is working with General Dynamics Land Systems on the project.